I mean I thought wow this is cool, anything clone wars could drop. NOPE 150 shards later and not 1 box dropped. Not that I didnt want anything to drop but after 3 sims of 10 each I was like wow just 1 shard to drop would be nice but nope. Again with a big prize dangled in front of us and no payout. Instead of wasting time programming and testing these underwhelming events I wish they would just spend the time on something else. Like a road ahead lol or fixing CHS in LSTB or the countless other things we want that won’t break the game. Put these hours to a ship raid, or figuring out a non marquee way to release a new toon. Would hate to actually know the man hours spend on this.. I could care less if its a kenobi or gervious shard. 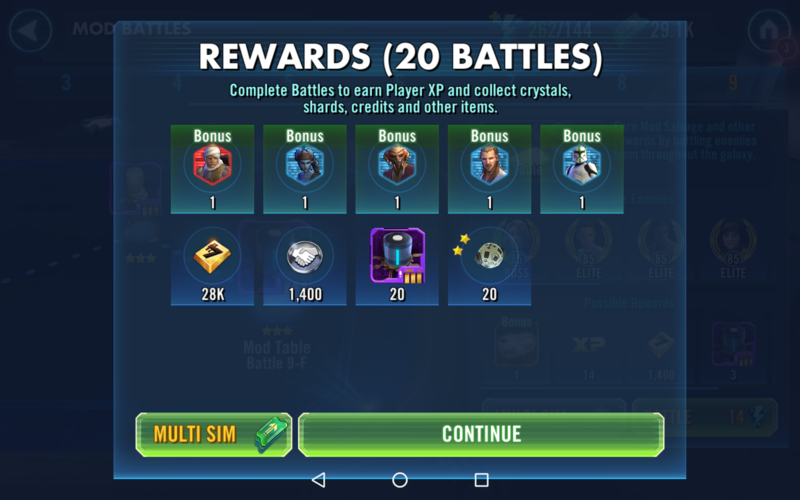 I was hoping for ANY 1 SHARD to drop. GG I wont be taking part in this |celebration"
It's also not a great way of getting shard shop currency. 500 energy gave me 105 shard shop currency. 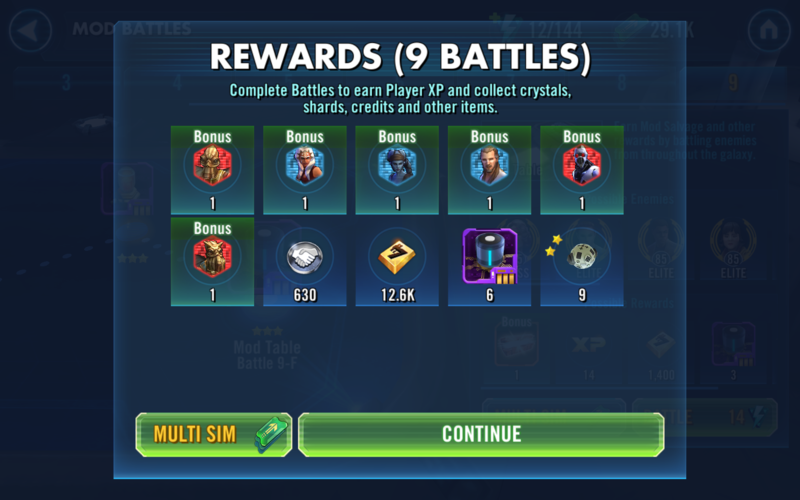 I didn't think it was possible to come up with a worse idea for "bonus drops" than those mod slicing materials, but wow, CG pulled it off! And before anyone says "they aren't meant for endgame players who only need Jango", new players can't reach mod battles 9, and should probably be focusing on farming mods before farming slicing mats, so it's all around bad. But since it was proved this event was a joke, why should moderators underestimate our intelligence and try to convinse us that we are wrong???? 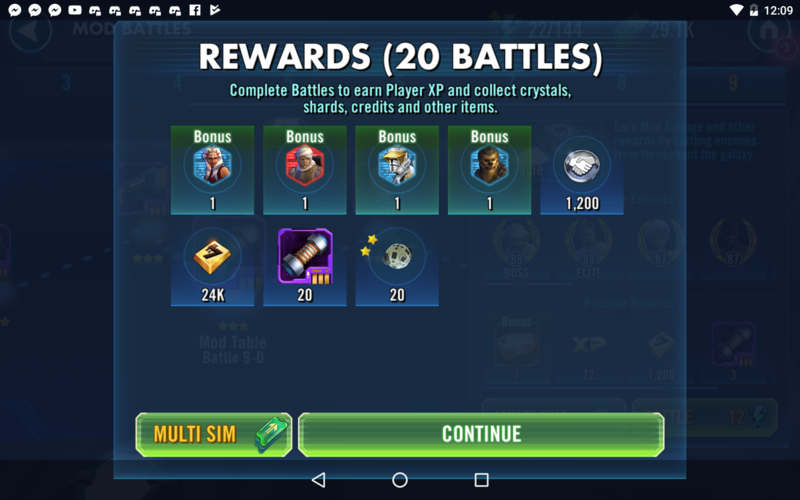 Thank you EA/CG for the great celebration event and the opportunity of getting free Clone era characters as a bonus drop on mod shard nodes. 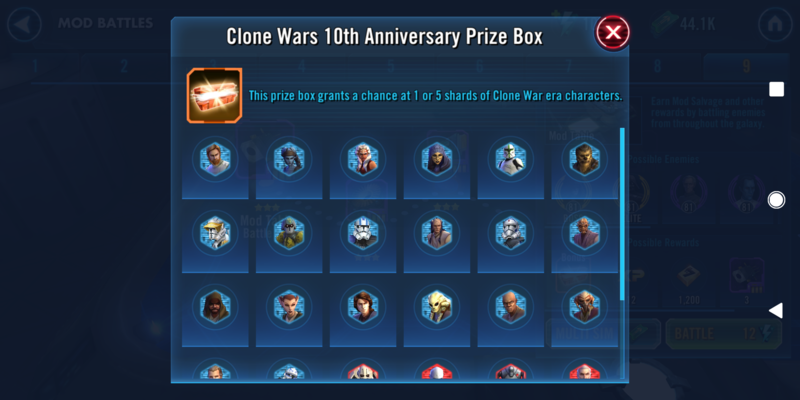 I have to admit, the opportunity to get a FREE, GG, GK, Jango, Zam, CUP, Kit and so many more characters, a total of 36, was something I was thrilled with the moment you announced this. -- put the kids to bed and explain to the wife that there are more important things in life than couple time and candles, geez. 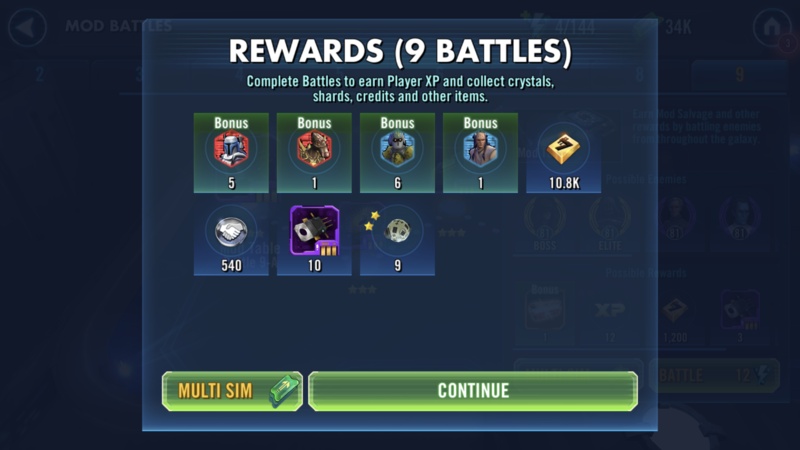 To make this short, after doing about 85 sims on all nodes, I managed to get 1 Kit Fisto , 1 CUP and 1 Chewy shard, a total of 3. It’s all RNG. 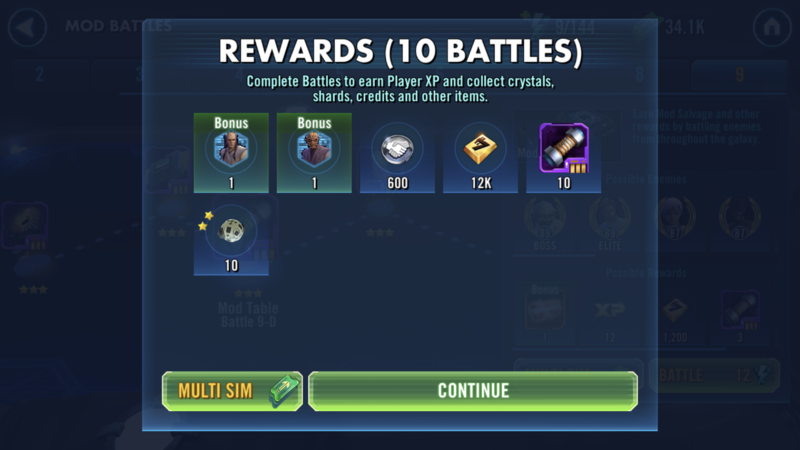 You guys complain too much.i got a bunch of shards so far and even this one, which shows that it might be possible to get more than 1 shards per battle. I won’t ever complain about free things. I've been awake for hours. What a fantastic Celebration. 10 years old. Woo hoo! I love the game I play it a lot and I continue to play it because it I’ve played it so long (month after release). I paid for CLS and didn’t mind that I had to wait for revan or jtr when they were released. My biggest gripe is that there are no r2d2 or tie fighter pilots anymore. Absolutely everything is behind a paywall and essentially the same paywall if you’ve been playing 3 years or 3 months. 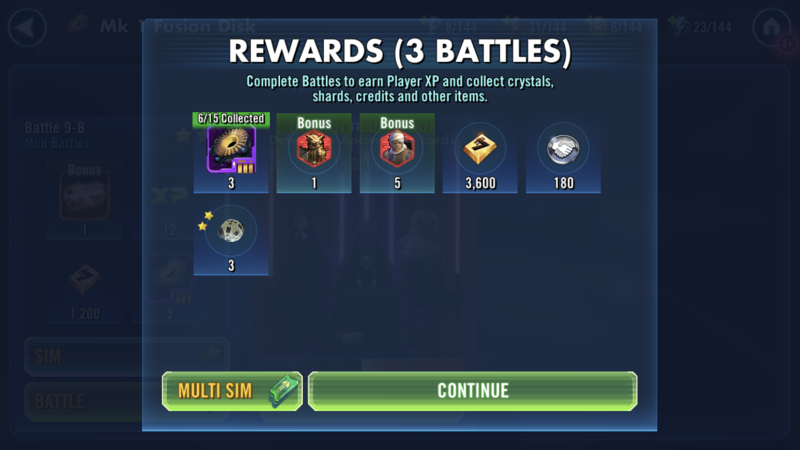 Dudes just save crystals for hard node and cantina refreshes, it’s the only thing worth spending them on, this will never change. It specifically said SELECT characters from the clone wars era. Instead it is every character from the clone wars era, and even some that weren’t, like Qui Gon. Is this the first time youre playing an EA/CG game? Everything they do is about ripping off, including scamming. I didnt get anything near like that. I dont believe those numbers. Must be fake news!!! I don't know if this was popular in other countries, too. But here in Germany we had the so-called "Kaffeefahrten"
Companies would offer a nice bus trip to a scenic location, including lunch and coffee break for a minimal fee. Between lunch and coffee break there was a sales show where you could buy useless and overprice junk. But the sales show was optional. You could also go for a walk and admire the pretty view. But as time has gone bye and people noticed that they were only selling junk, nobody stayed at the shows and nobody bought anything anymore. This was of course bad for the companies as the bus trips really were a scam. They were purposely marketed to elderly people because they were more gullibly to be tricked to buy their stuff. When people started to refuse to buy the stuff, they were told that they would only make the bus trip back home after a certain amount of merchandise was sold. This was of course all illegal, although there were such things hinted in the brochures etc and finally a couple of these companies were sued and the business model finally was finished. You might wonder why I'm telling you all this. Well, because we have the same toxic and misleading business model here. You're aggressively marketing a "celebration" with free shards for three of the most sought after characters. Handily there is also a 600 crystal pack for mod energy available the day before (of course not on the same day, because then everybody would have seen through the scam). And on celebration day you explain that it's not the three characters but only possibly the three characters and not even every fight drops a bonus but only random fights. You can justify this any which way you like but this is not a celebration where you give away free stuff to your loyal customers but a scam where you try to trick your gullible customers to spend extra money/resources. 50 crystals, and that’s what I grabbed, woohoo! Ok, I know all you super players love the new event and love defending your besties that work at CG. But this is the nearest to nothing event i have seen in 3 years. Anyone remember double drop weekends? Stop trying to be creative and just give us an event that will actually help a little. I always take what ever they give for free and say thanks, and even I have given up on this event in the first 8 hours. Horrible drop rates for lame shards. Thanks for nothing, literally! I dropped 150 Crystals the night before the boxs dropped I was other one who didn't read properly but guys make sure we misunderstood the message. I speak for most part of us who spent cristals on this deal either on energy bundle or doing refreshes we want our crystals back!